Throughout the history of the Church, the Holy Spirit has been endorsing some spiritual figures who not only leave their mark in their times but also become illuminating beacons for the future generations. Therefore, by looking up to them, we “the ones who have reached the end times” are able to sail through the seas of tribulation, of passions and of the devil’s delusions without danger, without “wetting our feet” to reach the port of the “true life”, of dispassion, of Sabbatism and thus accomplish our deliverance. Such personalities were the Three Hierarchs, St Maximus the Confessor, St Symeon the New Theologian, St Gregory Palamas as well as the Fathers of the Kollyvades movement. The presence of the Kollyvades during the 18th Century in the Holy Mountain and generally throughout Greece has caused an active return to the roots of the Orthodox Patristic Tradition. The forerunners to this movement have been sarcastically described by their adversaries in the Holy Mountain as ‘Kollyvades’, because they had opposed the nontraditional practice of transferring the memorial services for the deceased from Saturday to Sunday; the latter were correct in arguing that transferring these services would be an insult to the Festal Day of the Resurrection. More specifically the reason for the movement was provided by the monks of the Skete of Saint Anna in the Holy Mountain. In 1754, these monks had been trying to rebuild the central church of the Skete, the Kyriakon. But because they had to work on Saturday, they decided not to carry out the memorial services for the deceased on that day as they were traditionally held throughout the Holy Mountain, but on Sunday after the Divine Liturgy. This decision which contradicted the ecclesiastical tradition has tempted Hierodeacon Neophytos Kavsokalyvitis, who was at the time teaching at the Athoniada School - which the Holy Monastery of Vatopaidi had recently established in 1749 - and launched a dogmatic battle against the monks of Saint Anna. Hierodeacon Neophytos was established as the forerunner of the Kollyvades movement. Indeed the actual day that the memorial services were to be held constituted only a minor detail in the entire revitalizing and traditional mission of the Kollyvades movement. It had simply been deliberately exaggerated by their opponents, the so-called Anti-Kollyvades or Liberals, not only to bury their entire contribution but also to denigrate them as monks because they had been supposedly concerned with minor and immaterial things, like the memorial services and the kollyva. In the same way, the Maccabees because they hadn’t obeyed King Nebuchadnezzar on a minor detail, namely to eat pork forbidden by their Fathers’ tradition, had been terribly tortured and became Martyrs and genuine confessors of their Fathers’ faith; we venerate them as Saints of our Church. The confessionary aspect of our Orthodox faith is not only expressed dogmatically but also in the context of morality and tradition. Another cause for the appearance of the Kollyvades movement was presented by the publication of two books, the first in 1777 and the second in 1783, which dealt with the need to take Holy Communion often, and had been produced by the Kollyvades circle. The second book, written by St Nikodemos the Hagiorite and St Makarios Notaras, Bishop of Corinth, has been condemned by the Patriarchate in 1785, because it was allegedly causing strife and scandals. Later on, the Patriarchate presented the same book as beneficial and contributing to the salvation of the soul. With an official Patriarchate letter, endorsed by the Holy Synod, the writers were exonerated. From the outset, all the teachers at the Athoniada School had expressed their support to Neophytos Kavsokalyvitis; among them St Athanasios of Paros, Christopher Prodromitis from Arta, Hieromonks Agapios of Cyprus, Iakovos of Peloponnesos, Parthenios the Hagiographer and Paisios the Calligrapher. Let us pay specific attention to Agapios the Cypriot, among the forerunners of the movement, who did justice to our island, “the island of saints”. Later, St Nikodemos the Hagiorite, the great Saint and wise tutor of the Greek people, joined the movement together with St Makarios, Bishop of Corinth, a descendant of the famous Notaras family, and Hieromonk Dionysios of Siatista, the spiritual father of the Vatopaidi Skete of Saint Demetrios, and his acolyte, Hieromonk Hierotheos, the spiritual father at Protaton of the Holy Mountain. The main exponents of the Kollyvades movement, who in the 18th century had created a revival of the pursuit of virtue (‘φιλοκαλική αναγέννηση’ or 'philokalic renaissance') inside the Orthodox Church were: Athanasios of Paros, Nikodemos the Hagiorite and Makarius of Corinth. 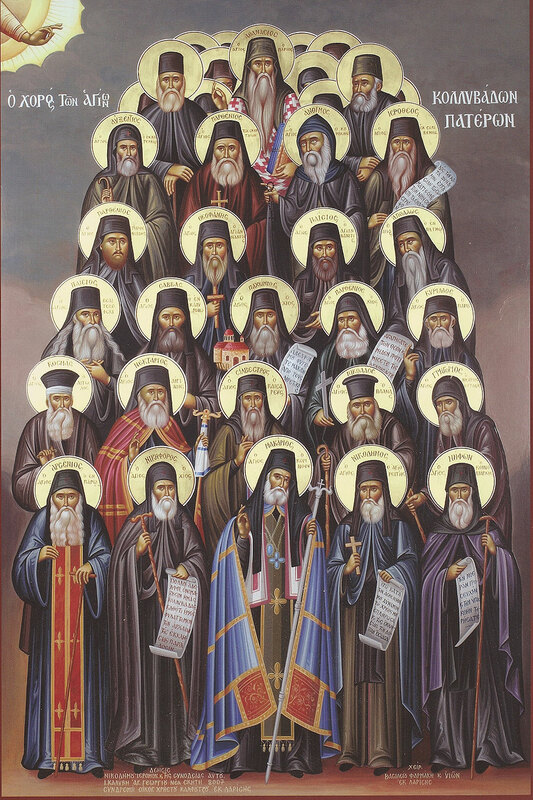 These people, because of their activities and their sacrifices, but mostly because of their pious and exemplary lives in accordance with the Patristic spirit, have been appropriately ranked among the Saints of our Church. Two Synods convened on the issue of the memorial services. At the order of the Patriarchate, the first one convened in 1774 at the Holy Monastery of Koutloumousiou in the Holy Mountain. Two former Patriarchs, eight head priests and approximately two hundred monks took part in the Synod. The Synod issued a decree of anathema for the Kollyvades. The second Synod was convened in Constantinople in 1776 under Patriarch Sophronios II. The Patriarch of Jerusalem Abraham and sixteen other head priests took part. The Synod issued a decree of anathema for the leaders of the movement, among them Hieromonk Agapios, the Cypriot, while it exiled St Athanasios Parios. In 1785, Patriarch Gabriel exonerated St Athanasios. However, the final justification for the Kollyvades movement on the issue of the memorial services and on the frequency of Holy Communion occurred much later in 1819 under the auspices of Patriarch Gregory V.
The Liberal Anti-Kollyvades had used all the illicit means available against Kollyvades. Namely slanders, accusations and smears. They even resorted to murder. The monks from Saint Anna called some renowned thief to murder four of the Kollyvades: Hieromonk Paisios the Calligrapher and his elder Theophanes, Hieromonk Agapios the Cypriot and Hieromonk Gabriel. The thief managed to drown two of them: Paisios and Theophanes. The Kollyvades‘ teaching was genuinely patristic. Their main objective was to convince people through their words and deeds, to adopt an internal life in Christ. They targeted their efforts on the issues of holy worship. They cherished the liturgy and advocated frequent participation in Holy Communion - namely the frequent participation in the mystery of the holy Eucharist after continuous effort and preparation. They promoted the strict observance of the rituals of the Church, because this safeguards the spiritual balance in the life of the Church. They also advocated reading Patristic writings because it enables the faithful to acquire a genuine patristic mindset. The three Kollyvades Saints - Nikodemos the Hagiorite, Athanasios Parios and Makarios Notaras - interpreted passages from Holy Scripture and from the Fathers of the Church, wrote biographies and liturgies in honor of Saints, and even schoolbooks on grammar, rhetoric and philosophy. Many Kollyvades also copied books by foreign writers and translated contemporary, western philosophers. They either did not avoid contact with modern ideas, by incorporating modern views and methods into Patristic teachings, or criticized them altogether. The shrewd Eugenios Voulgaris - who may easily be associated with the Kollyvades, even though he did not actively participate in the movement, since after 1762 he was in Leipzig and later in Russia – was deeply knowledgeable of the contemporary spiritual movements and critically assessed them in light of the Patristic tradition. What was foremost in the minds of the Kollyvades fathers was to awaken the enslaved nation to stand up for its faith and the traditions of its Fathers and to safeguard the Greek Orthodox culture and their lives in Christ. St Nikodemos wrote twenty-five enormous treatises. Among them one distinguishes the “Symbouleutikon Egheiridion" (Manual of Advice) which he wrote while exiled in the island of Skyropoula. His life then was filled with difficulties and hardships and was lacking even the rudimentary necessities, and of course books. He used plenty of patristic passages from memory in his book; this proves this great Father’s enormous ability to commit to memory, as well as the presence of Grace. This treatise is a manual for anyone who wishes to experience life in Christ, tries to control his senses, and practices noetic prayer along with everything else which contributes towards the spiritual perfection of the person. St Athanasios Parios, who is regarded as the feistiest of the Kollyvades, wrote fifty-three treatises. He especially fought against the atheist movement of Voltaire: the delusion which had tried to enter the Greek Orthodox realm under the guises of Enlightenment, natural religion and rationalism, but in effect was hiding atheism. In addition the Kollyvades were the spiritual fathers of the New Martyrs. They had the duty to prepare and psychologically support towards martyrdom those who had initially forsaken their faith, but having repented and been replenished with divine eros, were eagerly seeking martyrdom and were insisting to follow this road. St Makarios Notaras had “spiritually prepared” and contributed towards igniting the ‘divine flame’ of the love of Christ in the hearts of three great new martyrs: Polydoros of Nicosia, Theodore of Byzantium and Demetrios of Peloponnesos. The blood of the new martyrs rose to the Lord like fragrant incense which brought freedom to the enslaved nation. St Nikodemos collected the biographies of several such new martyrs in his book “Neon Martyrologion” (New Martyrology). The Kollyvades caused a hesychastic revival in the Holy Mountain and were the bearers of the Patristic tradition. 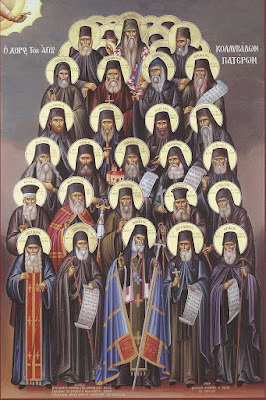 They were the ones to preserve the development and way of life of the Holy Mountain for over a thousand years in contrast to the Anti-Kollyvades, who had been influenced by the European religious Enlightenment, which advocated the secularization of the Church and the adaption of Orthodox monasticism. The latter led an imperfect monastic life, the so-called “rough monasticism”, and have had no experience of divine Grace through the Orthodox tradition. That’s why they opposed long liturgical services, the frequent participation in Holy Communion and Confession, the allotted reading of spiritual books, the noetic exercise and the practice of the prayer of Jesus. They exhibited no internal spiritual life. The Kollyvades were attesting to the role of the Holy Mountain as the carrier of the genuine Patristic tradition. They stood by the line of the great Fathers of the Church – particularly of the hesychast and neptic Fathers of the 14th Century – and did not permit the adaption of Orthodox monasticism as in Russia under Tsar Peter the Great, who was an ardent westerner. He had promoted the westernization of the Orthodox faith which culminated with the anti-monastic policies of Empress Catherine the Great. Even though the Anti-Kollyvades were more numerous and used illicit means as we have already said, and occasionally enjoyed the support of certain Patriarchs, they did not manage to crush the Kollyvades movement. The Kollyvades support for the Orthodox tradition and the fresh, widespread revitalization which was set in motion and was founded on the revival of hesychasm, soon passed on to Thessaloniki, Thessalia, Epiros, Peloponnesos and the Aegean islands. Most of the Hagiorite Fathers who were exiled or who exiled themselves went to islands near the Holy Mountain in the Aegean Sea. One such émigré was Hieromonk Nephon of Chios, together with four others - Gregory, Agathangelos, Ananias and Joseph. These, having stayed several years in Samos, Patmos and Icarus, finally went to Skiathos, where Nephon founded in 1794 the renowned Monastery of the Annunciation, which became the most important center of activity for the Kollyvades outside the Holy Mountain. Two literary persons from Skiathos who later became the spiritual backbones of the Kollyvades movement, were Alexandros Moraitides (who later became known as Andronikos the monk) and Alexandros Papadiamantis. St Makarios Notaras was constantly touring the Aegean islands to support and convey the Patristic spirit to the flock, particularly to the island of Chios along with St Athanasios Parios. Blessed Elder Hierotheos began his monastic life at the Vatopaidi Skete of Saint Demetrios, where Dionysios Siatistes became his spiritual father. However, after his elder’s death and during the second round of persecutions against the Kollyvades, he was forced to leave Mount Athos. He arrived in Poros and Hydra, where he establishes the holy monastery in honor of the Prophet Elijah. His brother, Hierotheos, became the new owner of the then abandoned Monastery of the Zoodochou Pege in Longovarda in Paros. It is from this monastery that Philotheos Zervakos, the well known to us abbot, hailed. St Arsenios the New, along with his spiritual father, Daniel, left the Holy Mountain and visited the islands of Paros, Sikinos and Folegandros. St Arsenios stayed in Paros where he became abbot of the Monastery of Saint George. He lived there a very spiritual life, full of grace and comforted many people, steering them away from the ignorance which prevailed on the island. Konstantinos Oikonomos, Kosmas Flamiatos, Christopher Panagiotopoulos (the renowned Papoulakos), Ignatios Lambropoulos and St Nicholas Planas were some of the many spiritual figures of the 19th Century who had been kneaded with the Kollyvades’ spirit and became active in Peloponessos and Athens. Moreover, other Orthodox countries, like Romania and Russia, have directly or indirectly benefited by the Kollyvades, as it is manifested by the revival of hesychasm in these countries. In the 18th century, Romanians and Russians were initiated into the neglected Patristic spirituality by St Paisios Velichkovsky, who had lived for eighteen years in Kapsala of the Holy Mountain and in the Monastery of the Prophet Elijah which he founded. Then he later visited Moldova, latter day Romania, and became the founder of the ascetic “Starets”: namely of the holy Russian Elders, who by their saintly and charismatic words and deeds comforted not only the illiterate villagers but also the mighty intellectuals of their countries. In the 19th century, the spirit of the Kollyvades became the antibiotic against the spirit of change in Orthodox monasticism which had been adopted by westernized advocates - politicians and theologians - like Adamantios Korais and Fr. Theokletos Farmakides. However, even nowadays there is an undercurrent working against the Kollyvades spirit, against the spirit of the Fathers. The threat which favors the secularization of our Church is real. Many people advocate the need to shorten the services, to simplify the language of the Holy Liturgy, to limit the days for fasting and of the feasts, and abolish the iconostasis inside the churches. Many think that it is a delusion to practice noetic prayer, to use prayer rope or to take Holy Communion frequently. At the same time, more and more theological movements are being created, while others continue to exist throughout the life of the Church, but essentially exist outside the Church. We might say that there are some tendencies in theological circles which nowadays promote a similar way of life. The first such tendency is that of the so-called pietists and moralists. The advocates of such tendencies, who have existed throughout the life of the Church, place the emphasis on the external form; they exhibit a moral life externally, but basically they do not know what it means to attain the purity of the heart. They focus on the letter and do not permeate the essence. They believe that man’s deification is a moral and not an existential issue; namely man’s genuine participation in the uncreated energies of God. The second tendency is exhibited by those who advocate the so-called theology of the senses. They are highly intellectual people, prominent figures in the arts, poetry and music. They would like to link theology and art, so that theology becomes the nurturer of art. That is, to render the theology of our Church more poetic, more literary and more musical. Let us stress, however, that Orthodoxy and therefore, theology, does not belong to the Arts or Culture, but it creates art and culture. The arts and even our own lives must be connected with the Church in order to collect the "living water" (John 4:10). The third tendency is that of the traditionalists. They concentrate on the letter of the Patristic tradition but they change it in practice. They do not believe that Tradition is the natural and dynamic continuation of the Church. They identify themselves with its glorious past but they do not practice Tradition in their lives. They are the ones acquainted with Orthodox theology but do not practice it. They constantly speak about the need to return to the traditions and to our Fathers, but they have never experienced the divine Grace which had resided in the Fathers and inspired their every word and deed. Thus, they are proved to be fakes or as Paul the Apostle said: they are like “tinkling cymbals” (1Corinthians 13, 1). The fourth tendency is the one advocated by those who speak about present day theology (παροντική θεολογία). They move the center of attention from theology to anthropology and sociology. They support the idea that Patristic theology has come to an end; they are trying to establish a new theology which will tackle social problems since they believe that these cannot be solved by Patristic theology. They believe that the word offered by the Church is constrained and static and they do not accept that eschatology is feeding the Church; that the history of the world acquires its meaning because of eschatology. Nevertheless, there are many people lately who have acquired a deeper knowledge of the Patristic tradition, particularly of Hesychasm as the genuine practical experience. This experience is none other than the application of the Scriptures in our times; namely, the experience of divine Grace which assures that one is productively integrated in the Body of the Church where he experiences the fullness of true life and indescribable joy in his communion with other persons. Then man becomes an ecclesiological and thankful being, a true person in the image of the absolute and eternal person, Christ. We may endeavor to say with certainty that those who belong to the aforementioned four categories have acquired an intellectual relationship with God, became complacent and think that they know God. But they have not accomplished communion with God which relates to their whole existence and particularly with the noetic energy in their hearts; neither have they accomplished any substantial communion with their brother. The holy Kollyvades Fathers stressed that the spiritual center of the person is the heart and not the brain. That’s where all the mysteries of the unseen war are taking place, of our regeneration, and where divine Grace dwells. St Nikodemus the Hagiorite says that a man’s heart is a natural (φυσικό), beyond natural (παραφυσικό) and supernatural (υπερφυσικό) center. Christ Himself reveals to us that “the Kingdom of God is within you” (Luke 17:21). The Kollyvades were insisting in the frequent participation in Holy Communion because they knew that with Christ’s Body in the Holy Eucharist, the divine is inexpressibly and inseparably united with human nature, man experiences the common nature of mankind and the mystery of deification is accomplished. People who experience and offer a fake and impure Orthodoxy must coordinate with the life-giving Patristic tradition, which is advocated by the Kollyvades of the 18th century and the Hesychasts of the 14th century; namely, the Fathers of our Church. Thus the Kollyvades once again become our spiritual guides to the proper course inside the genuine Patristic tradition. The spirit of the Fathers remains always the same. However, depending on the social, political and cultural conditions of the times, the Fathers experiencing divine Grace, i.e. communion with the personal God, express their views in line with the ongoing arguments by the philosophical, theological and social tendencies of those times. The way the dogmas are being expressed and the way the path to repentance is being explained depends on the current dynamic terminology without altering the essence of the evangelical preaching which has always been: “Repent, the Kingdom of Heaven is at hand” (Matthew 3:2). Source: Αρχιμ. Εφραίμ Βατοπαιδινού Καθηγουμένου Ι. Μ. Μ. Βατοπαιδίου, “Αθωνικός Λόγος”, Ιερά Μεγίστη Μονή Βατοπαιδίου, Άγιον Όρος 2010.